Judith introduces the first miniature quilt that she ever made, which led to her interest in miniature quilts. She talks about quiltmakers who have taught and influenced her, as well as definitions for a miniature. In the second half of the interview Judith talks about her involvement with The Quilters’ Guild, explains free motion quilting, and how important the quilting community was to her when she moved house. Joy Morgan [JM]: So Judith, can I ask you to tell me a little bit about the quilt you have brought along today? Judith Dursley [JD]: The first quilt that I have brought along is the first alleged miniature that I ever made. 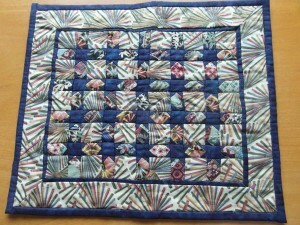 It was made in a workshop in Swansea Quilters, under the tuition of Shirley Davies. What we had to do was cut all the pieces before we went so it was two or three hundred half square triangles, two or three hundred squares. I can’t remember how many patterns we cut, but it was very arduous, so what I did was put it on a table in the kitchen, on a worktop in the kitchen rather and just carried on each time I went in there cutting a little bit more. I really, really enjoyed making it, but I didn’t enjoy the original work of having to cut all the pieces. JM: Can you describe the quilt, the size, the colours, the patterns? JD: The quilt is… squares and stars really, and if you see the picture of it, all the little blue triangles that makeup the star were each cut individually and you’ll can see it’s an early quilt because they are not the same size all over. I made it with a Japanese fabric and a plain, but I think I did manage to mitre the borders which I was quite impressed with myself for doing. As I say it was a very pleasurable experience and it was all pieced, most of it was pieced during the workshop as far as I can remember, but it was done in 2004 so it’s quite a long time ago, ten years ago. But it led me to a huge interest in miniatures which still is with me ’till present day. JM: And can you tell me the size of the quilt. JD: The first miniature I did was 15 inches by 13 inches and it would look in a photograph like a bed quilt if you had no scale to it which is the rule for miniatures really. JM: And what plans do you have for this quilt and how do you feel about it? JD: The plans that I have for this quilt… I had it on the wall for a time because I was so proud of it, of having achieved it. Now it comes with me during talks and I also take with me, when I can find them, the instructions for doing it, and all the cutting instructions and just make fun of them because I’ve found an easier way to work. JM: So when did you first start making quilts? JD: Before the millennium, before 2000, about 1996, I had to retire early from work and started to do a calligraphy class which was absolute rubbish, but somebody in the class mentioned this patchwork class that went on on a Monday morning. The teacher never kept still, she was always busy, always working hard, always encouraging and I went to her class and never looked back. So I’m still making quilts now. JM: OK, so when and where do you quilt now? 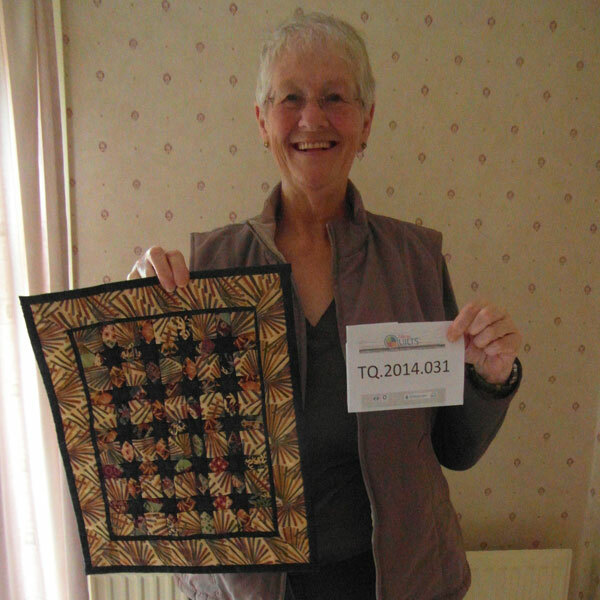 JD: I joined Port Talbot Quilters Group last but I’m also a member of Swansea Quilters. I sit and hand quilt mostly at home. 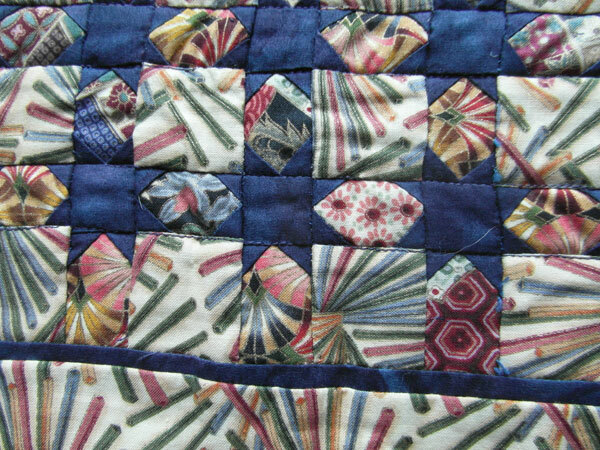 JM: OK, so how many hours a week would you think you spent actually patchwork and quilting? JD: Every evening, so say three hours in an evening, every day, that’s twenty odd hours and probably during the afternoon I’m either cutting fabric for a workshop or doing something else upstairs, so, I don’t know, about five hours a day probably. JM: And where do you get your ideas and inspiration from? JD: All over the place, as I say for this first one I worked to a pattern, but then I do like traditional blocks and the second one which is my first miniature one twelfth miniature quilt. I look at large quilts and wonder what they would look like made smaller, and my objective is to go as small as I can. So that’s where I get my ideas from really. JM: OK, so would you like to tell us a little bit about the one twelfth? 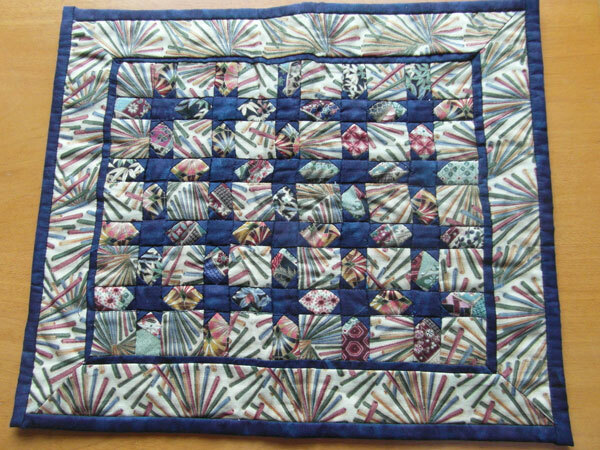 JD: One twelfth quilt came about because of a Regional Day in Region12 where there were twin sisters, Eirlys and Ellen from Pennarth, and one of the sisters spoke about miniature quilts, and she said that a true miniature should be one twelfth the size of a full sized quilt. So a 12 block should be an inch. And I thought that that was absolutely ridiculous. But the more I thought about it the more I wanted to try and so that’s what I did and I made my first one twelfth miniatures block which is square in a square in a square. There are four, eight, thirteen pieces to the inch and it’s surrounded by half inch flying geese. JM: Why one twelfth? What’s the reasoning behind making something one twelfth? JD: I think the reason is because dolls house furniture is one twelfth the size of a normal house furniture and these quilts are supposed to fit into dolls house dimensions, and this quilt, not this quilt, but three other quilts that I’ve made, did go into a dolls house shop in York with miniature models and they did look like full sized quilts. They were put on stands and miniature people were put by them miniature models and they did look like full sized quilts. JM: Can you explain to people what a block is? JD: A block is a part of a quilt that you’ve probably constructed beforehand, made up of perhaps a lot of different pieces, perhaps only one piece, but when put together with other blocks will make up a larger piece of work which constitutes a quilt. JM: Can I ask you how did you start quilt making? JD: I made… when I first started with the tutor in the Midlands. JM: But what started you… what made you want to start quilting then? JD: Because of the person that I attended classes with. JD: She was such an inspiration and I didn’t make quilts for some time. I had about a dozen cushions and didn’t have anywhere to sit down anymore. So I had to make a quilt. And I can’t remember whether we made a Jennie Rayment quilt first or whether we made a Lynne Edwards quilt first, which was the sampler quilt. But it just took off I don’t know, it became an addiction. I’ve always liked doing small things and because this calligraphy class was so bad and the second class that I went to for patchwork and quilting was so good, she just totally inspired me to carry on. JM: And are there any other people in your family who sew? JD: My sister’s got… my mother sewed but my mother was one of the people who thought that nobody could do anything as well as her. And so, she made our dresses when we were younger, but we were only allowed to play with the sewing machine by turning the handle when the lock was on it on an old Singer. She didn’t think we… and I had made a few clothes for my daughter when she was little, a few dresses but no I’d never sewn, I did cross stitch and soon but I’d never done patchwork and quilting. Indeed the first class I went to I took some cut papers and three different fabrics and I was going to sit and make some paper pieces… fabric over paper pieces. But the teacher said ‘no I’ve got enough for you to do it as well’, off we went. JD: I love to do free motion quilting. I’m not much good at it but I do like to do it. JM: And can you tell me what free motion quilting is? JD: Free motion quilting is well, you use the machine with a different foot which is what helps the machine to work, but you can move the needle then and you can move the fabric underneath the needle from left to right, backwards and forwards, round in circles if you so desire. There are feed dogs on a machine which you’re supposed to drop, but I don’t because I find that I can work much better without. However, I’m not very good at it and on a miniature quilt it wouldn’t really work. I love hand quilting but I don’t like the length of time that it takes and I’ve got a quilt that I’ve been quilting for quite a while already. But I do like free motion quilting. JM: And can I ask you why is quilt making important in your life? JD: Because I don’t know what I’d do if I didn’t do it. It’s… it’s… when I moved house it gave me a whole new lot of people to become acquainted with, a whole ready-made group of friends, which you sort of become friendly with everyone to begin with and then sort of sift through and find the people that you are most in tune with. So that when I moved I didn’t move and just be friendless when I, when I moved. 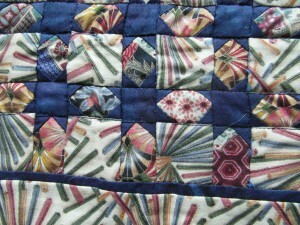 I work for The Guild so most of my time is taken up with patchwork and quilting. I don’t know what I would do quite without. JM: Can you explain what The Guild is? 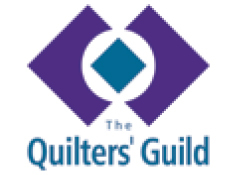 JD: The Quilters’ Guild is a charity that’s got a collection of quilts, heritage quilts, some modern quilts, some older quilts, their headquarters are in York, and they, they exist as a charity for like-minded people. Anyone can join The Guild. You don’t have to be an experienced quilter or anything else. But the network that it provides is second to none, if that’s your interest. I work on the side that does the fundraising which is called Festival of Quilts Ltd. and I deal with making money and the A.G.M. and the calendar and various other bits. JD: I tend to take an hour off in the afternoon. [Both laugh] I do, I will not do Thursday morning. JD: That’s the only time that they can’t reach me… the last email I got last night was at half past nine, and that was Sunday night. I’ll answer emails anytime, I ring the office anytime, and they are very good at answering queries that I come up with. But Thursday mornings between half eleven and half twelve are mine, and that’s the only time that nobody can reach me or disturb me because I’m in Tai Chi. JM: Well done. Is there anything else you would like to add before we finish? JD: I don’t think so, only the fact that I’m so grateful to The Guild. 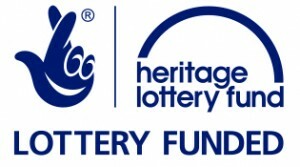 When I did move I had my teacher who as I said was my inspiration, gave me the knowledge to meet people in my new area where I would have known no-one… so because of that I joined The Guild and I just feel so grateful for the organisation being there. I don’t know what I would have done without it. I would have just sat and sewn on my own I suppose. It’s… the miniatures have meant that I’ve been able to travel all over the country doing workshops and speaking, all at other peoples’ expense really which is very good. And I do thank the twins in Pennarth who are very dear to us… [we took a short break as Judith became quite tearful talking about the twins] and I do feel that even though one of the twins has since passed away in the last eighteen months, she is still very near to us and dear to us because of the legacy that she left behind, and if I could copy what she has done in any way by encouraging other people, well then, she’ll live on as well. JM: Well, thank you very much Judith. JD: Thank you [Judith was still rather tearful and emotional].